Leadership, brilliance, craving for excellence and down-to-earth are words that come to mind when one comes face-to-face with Surendra Srivastava. The phrase ‘Workaholic’ sums up his success story. He is a visionary and is on a mission to build a better India. Millennia ago, Plato had said, “Those who shun politics are destined to be governed by people far inferior to them”. Surendra believes that, one cannot love democracy and hate politics. Democracy demands an aware citizenry willing to act when required”, He has repeatedly emphasized that the answer to “Bad Politics” is NOT “NO Politics” but “GOOD Politics”. It is this motivation that has inspired Surendra to enter the political & governance reforms arena. His desire is that all educated people, and especially so the youth, must take an active interest in politics and governance, and that if many more leaders from various walks of life enter the political arena, transformation towards the India of our dreams can be a reality within 2 to 3 electoral cycles. (Where Society will have a fine balance between "DHARMA" (right vs. wrong), "ARTHA" (Wealth) and "KAMA" (Desires) and Nation's success will be measured in terms of "HUMAN HAPPINESS INDEX". Surendra, born in Delhi in the home of an army soldier, arrived in Mumbai in 1967 when his father had his last posting at Mumbai Sub-Area Headquarters of the Indian Army. His early schooling was in a Hindi medium in the Colaba Municipal School. The family shifted to the suburbs (Goregaon) in 1972. He joined the RSS in 1972 and started a Sayam (evening) Shakha in Bangur Nagar, Goregaon (west), Mumbai and served as its Karyavah & graudually moved up the ladder in due course. Parallely to augment this effort & to involve youth who were not first interested in Sakha, he started a youth club “YUG CHETNA”. The shakha became one of the best and most well attended shakhas of Mumbai with this twin effort and produced some of the finest swyamsevaks, karyakartas and leaders, who are currently serving the Sangh & BJP in various capacities at higher levels. He being eldest son in a big family had to leave everything and support his family. When he was 16 years old, in addition to his studies, Surendra was forced to start working as an office boy to supplement the family income. He completed his graduation in 1979 with University of Mumbai and obtained his Bachelor of Law degree in 1984. He had a remarkable professional journey from a clerk rising to become in 1997, President of India's largest private sector, publicly listed ship owning, Rigs Owning, Helicopter owning, Shipping and oil & Gas Service Provider / Company including EPC contracting for offshore marine construction with the compounded growth of 43% year on year during his presidency till 2005. This exemplifies his grit and determination as despite being from a disadvantaged background he rose to overcome it. Then, he turned attention to his first love, public service. Surendra is thus, a corporate executive by training, in public service by choice, and a democrat by conviction. His interaction with politicians and civil administration in India had given him an insight into the painful political and governance system in India. He firmly believes what India needs today is not merely periodic change of players, but a fundamental change in the rules of the game. In the year 2000, he came into contact with Dr. Jayaprakash Narayan of the “Foundation for Democratic Reforms’ (FDR), a research and advocacy organization & “Lok Satta Andolan”, people’s movement, both established in 1996 and was deeply influenced by its vision for India's transformation. Society can NOT have a smooth ride until India has a combination of excellent drivers (Leaders), Excellent Vehicles (Institutions) and Excellent Roads (laws/policies). Having realized the need for holistic reforms to break the vicious cycle of electoral outcomes, mis-governance, the wheel of corruption and for governments to deliver citizen centric governance, he quit his corporate career in 2005, in his early forties to devote himself to this cause. However, thereafter till date he continues to do business strategy, restructuring, organizational strategy and team building advisory work primarily in the Shipping, Port, Oil & Gas Services, and Infrastructure Development & Supply Chain Management sector (s). Drafting of Right to Information Act 2005 - Through First National Advisory Council (NAC) to the Prime Minister, headed by Smt. Sonia Gandhi, Loksatta being one of its member amongst fourteen. Successful 2001 PIL in Supreme Court for Increased transparency in the electoral process – Mandatory Disclosures by election candidate’s criminal record and theirawa wealth. Procedural improvements in Indirect Taxes – Through Central Vigilance Commission (CVC). Loksatta being one of member of its business advisory committee. Amendments & strengthening of the anti-defection law in 2003 through then law minister Shri Arun Jaitely. Post Offices as nodal agency for Voters Registration, under implementation on ground. Holistic Governance including local government, police, judicial and civil services Reforms through 2nd Administration Reforms Commission 2006 (ARC) headed by then law Minister Shri. 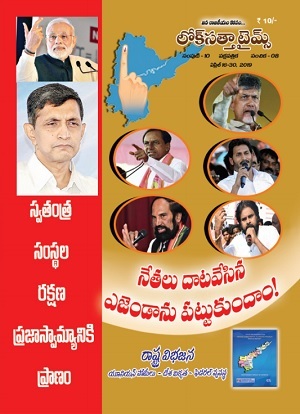 Veerappa Moily, Loksatta being one of its members amongst five. Drafting of National Judicial Accountability (NJAC) Act 2014, which was stuck down by Supreme Court retaining power with SC collegiums for judicial appointments. Political Reforms - Vote India Campaign - Mixed PR System of elections, Directly Elected CM's and Law for Internal Democratization of Political Parties. Urban Governance Reforms including Maharashtra Community Participation Law / Model Nagar Raj Bill which became one of the mandatory reforms under JNNURM. Election of Citizen Candidate Mr. Adolf D’souza from Ward 63 in 2007 BMC elections – Through Area Sabha per polling booth concept - Vote Juhu Campaign. This proved that local government reforms a necessity to improve conditions in urban India. Drafting, National health policy declared by government in the year 2017. Drafting new education delivery policy for government. In pipe line. Successful PIL in Supreme Court for cancellation of “120”, 2 G Licenses to expose crony capitalism & high level political and corporate collusive corruption. Successful 2016 PIL forcing Maharashtra government to shift IPL matches outside due draught situation in Maharashtra and now involved in drafting water policy for government of Maharashtra. Pending PIL for correct implementation of 74th Constitution amendment in Mumbai for decentralization, empowerment, and community participation in local government. Pending PIL in SC for changing process and methods for voter registration in India. politics & governance, we must never allow the impossible best to become the enemy of the possible good. Political fragmentation of India is real, and the idea of India is now in retreat. The national electoral verdicts are merely aggregates of state verdicts except to certain extent General Elections of 2014. He believes we must work collectively to rebuild a political India. This needs both public education and systemic change. Unless national parties can survive in all states with a moderate vote share by translating it into seats, India will be increasingly fragmented on parochial lines. 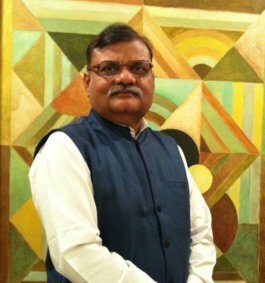 Finally, Surendra is a person who has a history of rescuing organizations from the brink of disaster, reconciling conflicting interests in a highly polarized environment and staying on course with the eye firmly on the objective without prejudice and malice. His own personal life is a testament to that. He has never shied away from taking a hard but right stance on issues, in the best interests of the people & organization, no matter how painful the choice.